Photo of: West of Ireland: Tipperary: Lough Derg from Tountinna. 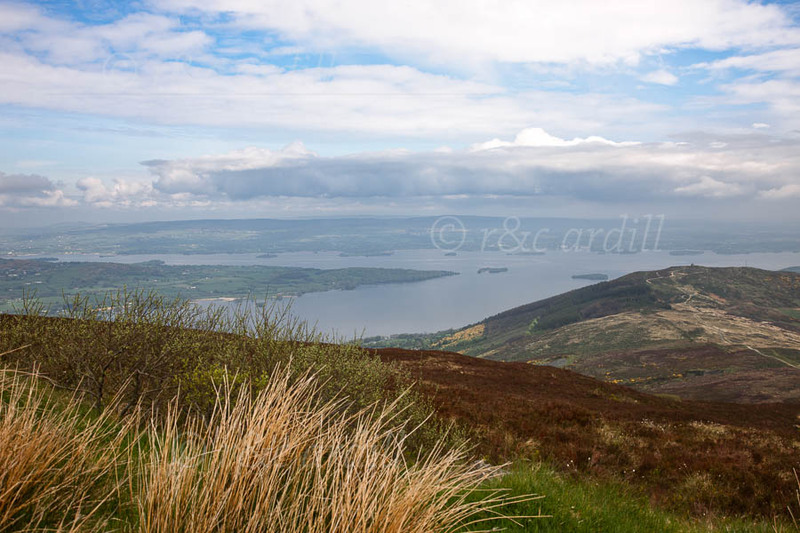 A view of Lough Derg from the summit of Tountinna mountain. Tountinna is a derivation of the Gaelic Tul Toinne which means 'hillock of the wave'. The wave in question was the biblical flood, which, according to Lebor Gabala Erenn (commonly known as the Book of Invasions), drowned most of the members of the first invasion of Ireland, led by Cesair. Fionntan was the only member of the party who took refuge in this mountain. While the others were drowned in the deluge, he survived to tell the tale to later generations. Near the summit is a tomb, to the left of the image, known as the Graves of the Leinstermen. A legend associates this with a bloody dispute between some of Brian Boru's men and some visiting nobles from Leinster, but the tomb is actually prehistoric. The hillock at the left of the mountain is called Knockaunreelyon (Cnocan R1 Laighean or 'hillock of the king of Leinster'). There is a large cross at the tip of this hillock.